Dark neck is quite embarrassing problem specially if you have fair face but dark neck. One of the big reason of dark neck complexion is that we often ignore our neck while washing our face.You have to remember that neck is extension of your face and your face never ends at your chin.Whenever you wash your face don't forget to wash your neck as well and when you apply any kind of moisturizer or make-up on your face don't forget to apply it on your neck as well otherwise continuous ignorance may result in further darkening of neck. Here we have a collection of some best home remedies to whiten dark neck. Let's have a look on them and get the maximum benefits from natural ingredients. To whiten dark neck, exfoliation at least once per week is essential to remove dark dead skin cells. To exfoliate your neck skin you can use a natural scrub. You can also sprinkle salt on the lemon and rub it on your neck for 3-5 minutes. 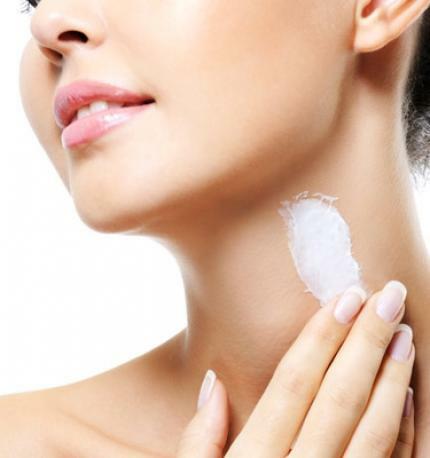 Finally wash off your neck and apply a good moisturizer to prevent skin dryness. Lemon acts as a natural bleach and cleanser and help a lot to remove dead skin cells and give you blemish free and glowing skin. Lemon juice is also very effective to whiten dark neck caused by sun tanning. Make a paste by mixing one teaspoon of lemon juice, one teaspoon of cucumber juice, and a pinch of turmeric powder. Apply this mixture and leave it for 20 minutes to dry and then wash it off. Repeat it regularly and see the difference within few days. To whiten dark neck, take 1 teaspoon of sandalwood powder and mix with enough rose water to make a thick paste. Apply this paste at bed time and wash it off in the morning. For a black neck due to excessive Sun tanning, apply a paste made of oatmeal, curd, and fresh tomato juice on the affected region. After 15 minutes remove this mixture with fresh water. Repeat this regularly for 2 weeks or until you get the required results. Mix 1 teaspoon of dried orange peel powder with some milk to make a thick paste and apply it on the neck area. After 15 to 20 minutes wash it with fresh water. To whiten dark neck make a mixture by mixing a pinch of turmeric powder in one tablespoon of lime juice and apply this mixture on the neck and wash it off after 15 minutes. Potato is natural skin bleaching agent and helps a lot to whiten dark complexion. To whiten your dark neck you can rub the slice of potato on dark neck skin. Repeat this regularly at least for 2 weeks. Another effective remedy to remove sun tan and to get fair neck complexion would be to soak 4 almonds in water for 3-4 hours and remove their skin then grind these almonds and make a paste by adding few drops of Rose water. Apply this paste at bedtime. Remain this paste on your Neck overnight. In the morning, was off this paste with fresh water. Repeat this remedy until required results. Application of fresh aloe vers gel is also very effective in getting rid of dark neck. Aloe vera is a kind of natural skin lightener and also moisturizes the skin. Aloe vera is also rich in antioxidants and various other compounds that help repair and produce new skin cells. Extract pure aloe vera gel from the leaf. Apply it directly on the neck and gently massage it. Leave it on for 20 minutes and then wash off with fresh water. A mixture of crushed walnuts and milk is also very effective in getting rid of dark neck. Apply this mixture on your dark neck and slightly scrub the area by applying gentle pressure. After 15 minutes wash the area with fresh water. A mixture of lemon and honey is also very effective to whiten dark neck. Apply this mixture on your clean neck, massage for 2-3 minutes and then leave for 15 minutes. Finally wash off with lukewarm water. Milk cream works as a great natural cleanser. This will also help in turning your dark neck into soft and white neck. Massage your neck with milk cream for 5-10 minutes and then wash off with lukewarm water. A mixture of Yogurt and lemon juice has been shown excellent results in getting rid of dark neck complexion. Take 1 tablespoon of yogurt and mix with 1 teaspoon of lemon juice and apply this mixture on neck at least for 20 minutes.Finally wash of with lukewarm water. Cocoa butter helps to moisturize the skin and reduce the dark appearance of the neck. Milk gently cleanses the skin and also lightens the skin. Mix equal quantities of cocoa butter, milk and honey and apply it on the neck at least for 20 minutes. Papaya is also considered very effective for skin exfoliation, gently remove dark dead skin cells and promote the growth of new cells. Take 1 fresh papaya slice and rub this on your dark neck at least for 5 minutes. Leave for 15 minutes and then wash off with fresh water. A mixture of almond oil and Vitamin E oil has been shown excellent results in getting rid of dark skin. This mixture not only helps in lightening dark neck but also help a lot to remove skin wrinkles and fine lines caused due to aging. For best results apply this mixture before going to bed day and next day remove with lukewarm water. Try to drink at least 10-12 glasses of water daily because water not only helps to remove toxins from your body but also helps a lot to give you fresh and blemish free skin.